"Tidy is as tidy does." We built this simple book case to address the problem shown at the right. Yep, too many books, not enough organization. We didn't start out with that many books, they just accumulated over time and though we had grand plans for a fancy book case, those somehow never got off the planning stage. A couple of quick measurements, harvest of the scrap material in the garage, two coats of white gloss paint, and a couple of hours time was all it took. 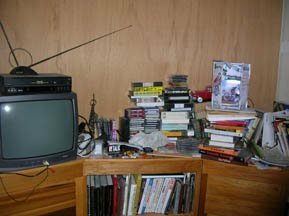 The space we had to fill is on top of an existing bookcase set into an old closet that long ago was converted to house written treasures. A TV on one side dictated that our lower shelf be at least 20 inches high. Proportional guesswork told us that 15 and 10 would be reasonable heights for the next two shelves. We drew up a detailed plan and headed for the shop. 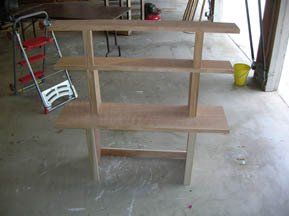 We used scrap 3/4-inch plywood for this simple book case and some poplar we had left over from so many other projects. 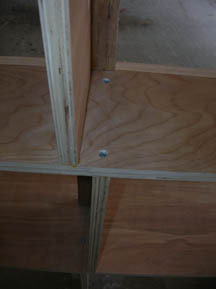 The shelves are offset to allow us room to drive screws into the supports. The resultant support misalignment is hidden by poplar strips ripped down to 2 inches. Our lower shelf is 12 inches deep while the top two are 6. That's because we had two pieces of 12-inch plywood available. But it also adds visual depth to the finished case. One drawback to using scraps is that we cut a support piece only to later look at the other side and reveal that it had previously seen use a drilling backer board. So we laughed at ourselves and cut another piece. 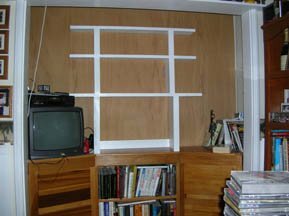 The shelf fronts are covered with poplar strips cut down to 1-inch wide and attached with finishing nails. We suggest gluing all contact surfaces. Rough sanding was sufficient for this painted project. We filled the nail holes on front prior to painting. Then added two coats of glossy white indoor paint. After allowing two days for it fully cure, we felt safe enough to place books on the shelves. Keep in mind that this is not meant to be a fine piece of furniture. This was built as a functional piece designed to fill a space and need. It can stand by itself almost anywhere in the house when we finally get around to building that really bitchin' piece later. When building one of your own, simplicity is key. 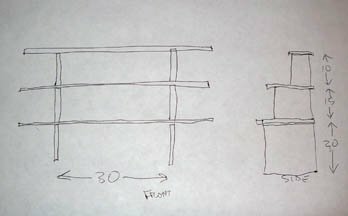 Define your space, make a simple drawing, gather up some materials, then build the thing. If we had to buy the material, this project would likely cost us about $20. And it was done in about two hours. 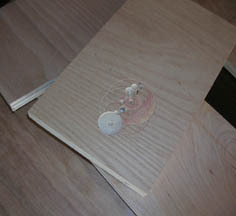 A table saw was used to size the long pieces along with a portable drill to drive the screws. This project looks pretty good. It accidentally has a Japanese pagoda shape to it. We're OK with that, and now our books are off the floor. Send us a picture of your simple book case, we'll post it.